HAND-MADE CONSTRUCTION — features 100% natural Walnut wood, sustainably sourced from Eastern Europe. Genuine sapphire crystal. Battery-powered (silver oxide SR927W included) quartz crystal analog movement powers bronze and white hands for ultra-accurate time keeping. Dual locking deployment buckle and reinforced clasp secure adjustable wood bracelet (removable metal pins secure links together). COMFORTABLE, NATURAL and DURABLE — Protected and sealed with tung oil (splash-proof). 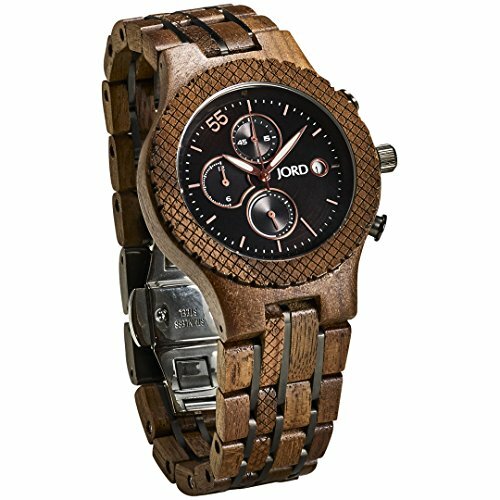 Unlike leather bands and low-quality metals, our hand-selected, premium hardwoods do not deteriorate or become brittle due to every day wear. Wood colors are naturally derived and do not contain any stains, dyes or harsh chemicals. Size can be adjusted by adding or removing links with at-home sizing kit, by local jeweler, or by JORD (mail-in).